Improves the tone and strength of the abdominal muscles and thigh muscles. Contraction of abdominal muscles produces a pressure on the abdominal organs thereby improving their function. Helps in the production of digestive juices and the process of excretion. Improves the tone of the muscles and ligaments of the uterus and the pelvic muscles. Helps the drainage of deoxygenated blood from the leg region towards the heart under the influence of the gravitational force. Due to only one leg being raised there is mutually opposing strain in the legs which gives different stretch to the legs and pelvic region. Strengthens the lower back, pelvic and perineal muscles. Beneficial for lower back pain due to the strengthening of the abdominal muscles. Removes flatulence and constipation. Strengthens the hamstrings. 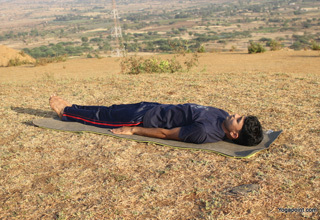 In supine position exhale and while inhaling slowly raise the left leg to a 90 degree angle from the floor. Maintain the asana, breathing normally. Inhale and while exhaling slowly lower the leg back to the supine position. Repeat with the right leg. If it is difficult to raise the leg straight then the leg can be slightly bent to release the pressure on the back, however the aim should, ideally, be to be able to raise the leg straight, when comfortable. If it is difficult to raise the leg to 90 degrees or if there is trembling in the leg then lower the leg slightly, until a comfortable position has been achieved.